Advertising paddle fans with your custom logo and message to promote your business or event. 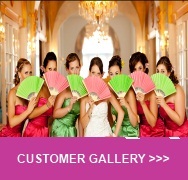 Our hand fans are also available as promotional fans for company advertising purposes, consumer marketing campaigns. The paddle fans are small but memorable giveaways - while at the same time they are also quite useful! These fans are well suited as promotional gifts & corporate giveaways, direct mail activites, for workshops, seminars, training courses, sales campaigns, business meetings. In fact, they will help people remember you and your special advertising message. If you have a special request for a custom shape fan, please email us diagram or photo of the fan shape you wish to quote, and we will price the fan shape and get you a quotation. Minimum order quantities of 200 advertising fans apply. Prices start from £2.69 each with a lead time of approximately 3 weeks from artwork approval. Please email us via our enquiry form with your request, special quotations or questions. Click here to see our gallery of advertising and promotional fans.